The Sacramento County Sheriff's Department showed off what drug agents took in Gilroy last week. They also said that it was the largest seizure of methamphetamine in United States history. 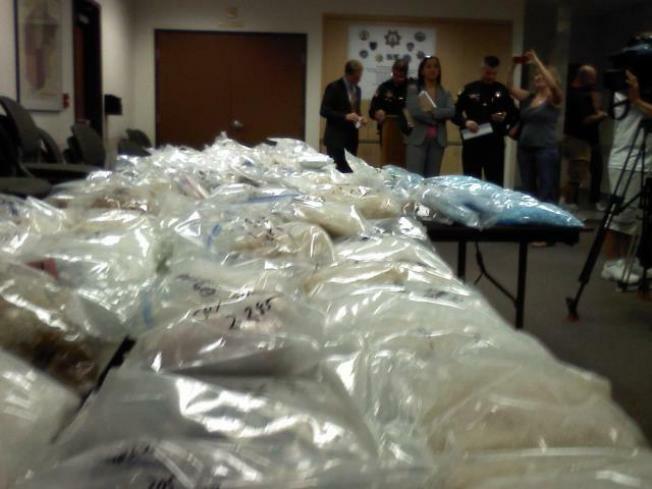 More than 600 pounds of pure crystal meth was laid out on tables, along with 15 pounds of cocaine. The meth alone has a street value of $200 million. The drugs were seized Thursday at a drug lab in a Gilroy home. Investigators said the lab is part of a Mexican drug cartel, and was being run by associates in Sacramento. Officials said the case began in Sacramento with some drug arrests two years ago. It was believed to be the prime hub of meth production and distribution for the entire Central Valley. It took a year of investigation for a task force of local, state and federal agents to make the bust. Sacramento County Sheriff's Department Lt. Fred Links said he has never seen a more workable relationship in the past eight to 10 years than the one with the agencies involved. The intelligence that was gathered led them to the Gilroy drug lab where police first arrested three Mexican nationals. By the next morning, seven were in custody awaiting trial in federal court. One person remains on the run. The Mexican nationals face life in prison if found guilty. While law enforcement called it a disruption of a major drug operation in the U.S., they said there is still more that needs to be broken up.